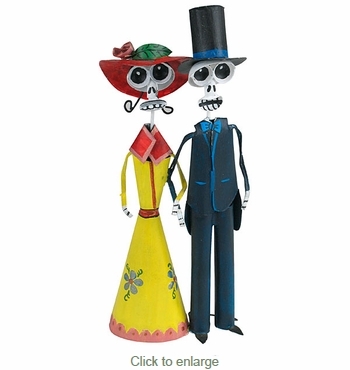 This painted tin Catrin and Catrina skeleton couple is a beautiful way to celebrate Mexico's Day of the Dead. These Catrin and Catrina figures are handmade from tin and individually painted by Mexican folk artists. These figurines are inspired by Posada's La Calavera Catrina prints.